Last year I participated in the most wonderful vintage sheet FQ swap. I cut up some lovely sheets into fat quarters, popped them in the mail and a few weeks later I unwrapped 50+ new to me squares of vintage sheets and fabrics.To say it gave my fabric stash a boost is an understatement! This influx inspired me to sew, make and create once again. As the months have worn on, my pile of vintage goodness has slowly diminished. I have been searching online for a vintage sheet or fabric swap for a while now with no luck. 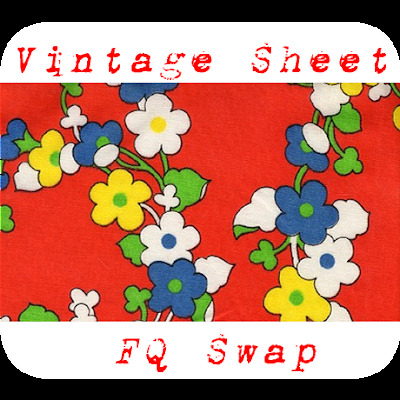 There are plenty of vintage sheet FQ swaps for U.S residents only but nothing for Australia. What you need to do... if you are keen to be involved in this swap then just leave a comment on this post indicating your interest with your EMAIL ADDRESS! Alternatively, you can email me at kellie_fm (at) hotmail (dot) com and let me know that way. As people sign up for the swap I will send out all the necessary information via email to participants. The time frame... Please have your vintage sheets washed, cut into FQ's and posted no later than the 22nd of April. This should give you plenty of time to scout your local oppies for plenty of sheets to cut and swap. I will have them back in the post for you by the 3rd of May and you should receive your new stash of vintage fabric sometime in the next week. Sign ups... I am happy to take sign ups until the 15th of April, as long as you have your FQ's in the mail by the cut off date. Spread the word... the more people we have involved in this, the more variety you will receive in your vintage FQ's. Feel free to blog about this and save the above image to use as a button for this swap... just make sure you are linking back to this post. How the swap will work... it is up to you how many fat quarters you want to contribute to the swap. The number of FQ's you send to me will be the number that you receive back. THEN... you will need to place your washed, cut up sheets into a pre-paid parcel post satchel (available at the post office in 500g and 3kg varietys). You should be able to fit about 15 FQs in a 500g satchel and 50+ in the 3kg satchel. you MUST also include a self-addresses pre-paid post satchel in your parcel to me for me to mail your new vintage loveliness to you. *it is more than okay for you to send multiple fat quarters from the one sheet!! *please do not send any sheets with cartoon characters, kids sheets or any solid colours. Over the next few days I will be posting some examples of the AWESOME vintage sheet FQ's i received in the last swap so you have an idea of what to be looking for! I will be updating all the swap participants through email and through this blog so stay tuned! i am so excited for this... I do hope that you will join me! i am loving this idea. will email you my deets. can't wait to see what you received last time! x ps. won't be able to make rummage this weekend but will see you at the next one! have fun. sounds like that will be cool! Sounds great, but I'll have to opt out of this one :( I'll be heading to France in 4 weeks and will be out of the country for most of April, not really a good time for a swap! tentative keen- need to look at my stash! Oh, I was in the last one and I loved it. Will have to see if I can find enough but I'd love to have the details! Awesome, thanks for the invite! I'd love to join in on the fun. Thanks for the comment and link ... you're definitely right I'm in! LOL Let me know if you need anything and I'll do what I can to spread the joy through my blog. i'm in. will search for something special in comming weeks! yes please - will have to start trawling! I'm in! Can't wait. I'm with Catherine, I have a sheet that I am questioning, perhaps I'll try a burn test? Count me in! I have a few sheets that could do with chopping up and being shared around! I ran one of these swaps 2 years ago - if you have any questions - just holler! It's a huge job - thank you for volunteering! I'd love to be involved. Looks like fun! I AM TOTALLY IN!! I participated in Ange's Rambling's Vintage Sheet FQ Swap last year and got some gorgeous sheets: that time I only had about 6 vintage sheets to cut up into FQ for the swap. Since then I have had the good fortune to find heaps of vintage sheets: so I would love to be part of this. yes, i'm keen to join the vintage sheet swap. I would love to take part too....can't wait!. I love me some vintage sheets - count me in! Hi, sounds great! Will it only be sheets? Or other vintage FQs, as long as they are cotton/blend? count me in...perfect excuse to go op shopping....as long as ali does not go to all the ones I go to lol!! count me in! my email address is swallace25@hotmail.com. I am so so SO in!